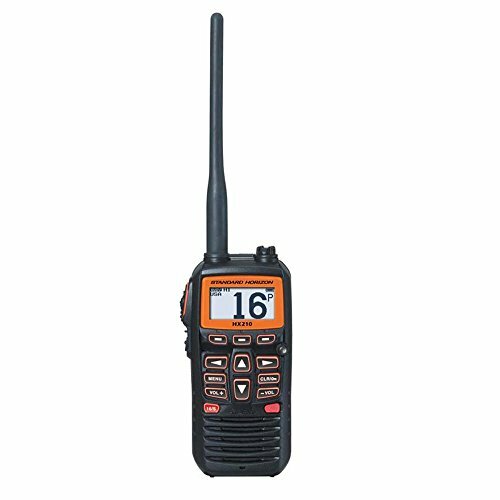 HX210 is an affordable floating handheld VHF radio with an FM broadcast band receiver and high-capacity Lithium-ion battery. HX210 is an extremely affordable floating handheld VHF radio. Oversized backlit full dot matrix display is easy to read and looks great in the hands of any mariner. Includes an FM audio receiver to listen to your favorite music. Selectable 6, 2.5 and 1 watt transmit power, E20 Easy to Operate menu system, and speaker mic jack to connect optional speaker microphones and headset. Packaged with 1800mAh Lithium-ion non memory rechargeable battery, rugged belt clip, 110 VAC and 12V DC 3-hour quick chargers and a drop-in charging cradle.